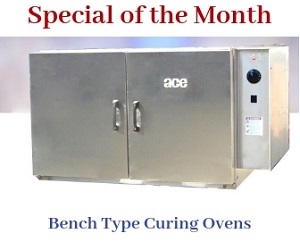 The ACE Model 4150-RT burn off oven is a heat cleaning system designed to get rid of additives and other contaminants from metal parts and components. The oven boasts of durable construction traits with a reinforced enclosure, and steel floor covers. Additionally, the oven is completely coated for optimum performance in industrial environments prone to corrosion. The oven features an automatic self-adjusting system that prevents the probability of errors during operation. The optional One Touch Control (OTC) system is located on the right side of the oven. It regulates the vapor levels within the oven during the burn off operation and aids in other operations. You can understand more about the oven by perusing the technical specifications provided in the following tables. Volume Over Cart 145 CU. FT. Exhaust Stack I.D. (2) 16"
Exhaust Stack O.D. (2) 20"
1 Top Mount Pressure Relief Hatch 11.02 SQ. FT. The afterburner supports the cleaning process by eliminating the pollutant filled smoke. The design and specifications of this model adhere to all requisite regulations including NFPA and FM (optional) as well as UL, and ISO.